Mermaids in Paradise and George Bush, the Dark Horse of Love. Lydia Millet. I will unapologetically compare these books to Mark Twain. The fully formed narrators who parlay sparkling ironic narration. The satire of US culture. The laughing to keep from crying. Why doesn’t Lydia Millet get more magazine covers? All the magazine covers! You put your politics in my novel, Lydia Millet. I know that the apocalypse is happening at every minute all the time. But is that any reason to ruin a perfectly lovely reverse roman-a-clef? 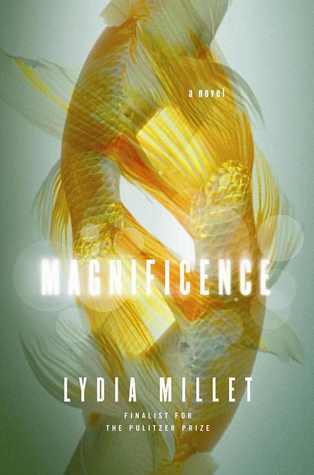 I’ve now read five books by Lydia Millet. All tremendous. All completely distinct in feeling. Each time I read one, I spend some time reminding myself that this particular one was written by that same author. Really? I ask myself. Really! I answer. But despite their stylistic or tonal disparities, each book is about the the same thing: the way that humans are destroying the world while building new worlds to hide from themselves the devastation already in their wake. In other words, each book is about Los Angeles. A Christian Scientist, a delusional messianic boozer pornographer, and a drag queen walk into a bar. The bartender says, we don’t serve your kind here. They all live in LA. Obviously. That’s pretty much the plot of this book, Lydia Millet‘s fourth book, from the mid-2000s. Let’s say three of the foremost Manhattan Project scientists—or versions of them—materialize in contemporary New Mexico at a crucial moment of their world history. The moment the bomb drops on Hiroshima? Let’s say a dangerously introspective librarian dreams of Oppenheimer at the Trinity moment. And then spots him at a bar on her way home from work. And at a funeral for a paranoid schizophrenic stranger who shoots himself in front of her, in the library’s children’s section. Shortly after she and her foxy gardener spouse decide to start having kids. Then, let’s say, you make it all a little bit funny. Is this how apocalypse might happen? So in the mid-2000s, I was thick in academic study of contemporary fiction, especially fiction that dealt with technology. I was also starting to feel uncomfortable with the prospect of writing about books exclusively written by white men (except for the Japanese guy, who nonetheless wrote from a perspective of cultural power and entitlement). I sometimes discussed this discomfort with academic mentors and peers. So when this book came out, why did no one tell me about it? This PEN-USA-award-winning book by a woman about the effects of nuclear power on US and world culture? Because graduate education in contemporary fiction is no place to learn about recently published contemporary fiction. I like the book so far and will review it in full when I finish it. My halfway-point teaser review: in this book about nuclear energy—when sub-atomic particles destroy very large regions—the book shuttles very quickly between the very large and very small observations. Characters speculate about the nature of this or that universal experience while they experience hyperlocal sensations, petty sniping, and the like. There are some Deadheads. I get a little tired of the reincarnated Oppenheimer’s obtuse reflections on the nature of suffering: but maybe that’s the point. Because he’s Oppenheimer. I’ll know more about this when I finish the novel! Click here to receive notifications of new posts by email. No need to keep checking back, every few hours, to see if I've posted something! Let the robots do that work for you! TfH is even better on Twitter.